Homemade drill press vise modification consisting of placing tapered pins into 3/16" holes drilled in the vise jaws. 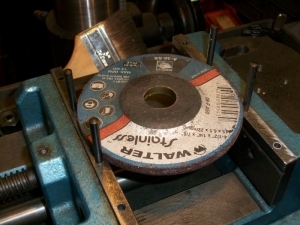 Pins enable round workpieces to be secured. Makes the vise more versatile. Great idea. Aha! It took a moment to focus on those dark colored pins...but when I did light bulbs went off in my head. I love it!